Tempe, Ariz. [3 November, 2016] — Artesyn Embedded Technologies today launched two new digitally-controlled dc-dc converters, the ADO300 and ADQ700, ideally suited to telecom, computing and server applications. Both converters are in standard DOSA compliant digital interface brick format and pin configuration and are available with baseplate or open frame options. Their high efficiency and superior thermal performance enables operation between -40 degrees Celsius and 85 degrees Celsius with air cooling - now demanded by telecom network and data center equipment manufacturers. Both new converters provide flexible and comprehensive digital communication via the PMBus® command protocol with control and monitoring functions for voltage, current, temperature and the reporting of fault conditions. They are ideal as isolated converters supplying power to downstream digital dc-dc converters such as Artesyn’s LGA80D series or analog point-of-load converters. The ADO300 is a new generation, single output digitally-controlled dc-dc converter with standard eighth-brick outline and pin configuration. This converter can handle an input range of 36 to 75 V, delivers up to 26 A output current at 11.7 V output voltage and features an outstanding 95.2 percent ultra-high full load efficiency with excellent thermal performance. The new ADO300 converter has an enhanced pre-bias start-up capability and for high current applications two converters can be connected in parallel, automatically using droop current sharing. The ADQ700 is a new generation, single output dc-dc converter with standard quarter-brick outline and pin configuration. The dc-dc converter can handle an input of 40 to 60 V and delivers up to 58 A output current at 12 V output voltage. 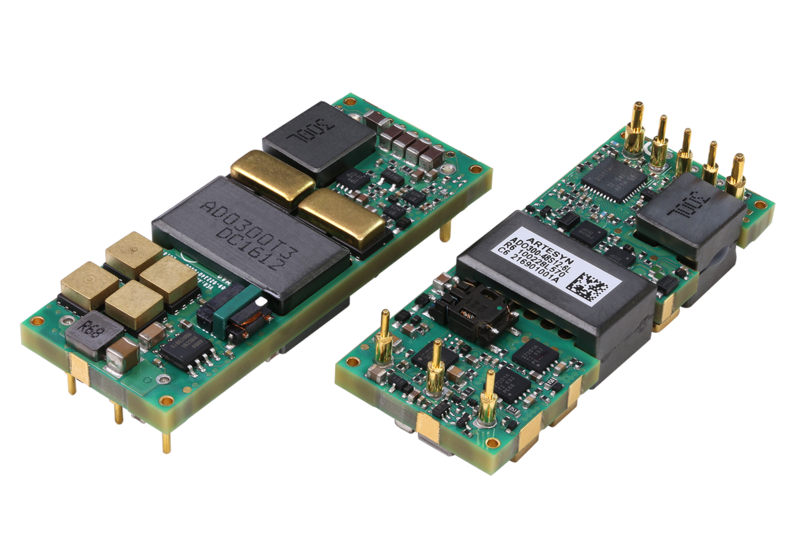 The ultra-high 96 percent efficiency typical at 50 percent load and excellent thermal performance, together with an enhanced pre-bias start-up capability, makes it an ideal choice for use in datacom and telecommunication applications. The ADO300 and ADQ700 are RoHS 6 compliant, feature input under- and overvoltage lockout, together with output overvoltage and current protection and full overtemperature protection. These dc-dc bricks extend Artesyn’s growing portfolio of digital dc-dc converters, which also includes the 500 W quarter-brick ADQ500 series.